I needed to make something for a cookout and I wanted to make something that reminded me of pasta salad and could be served cold. 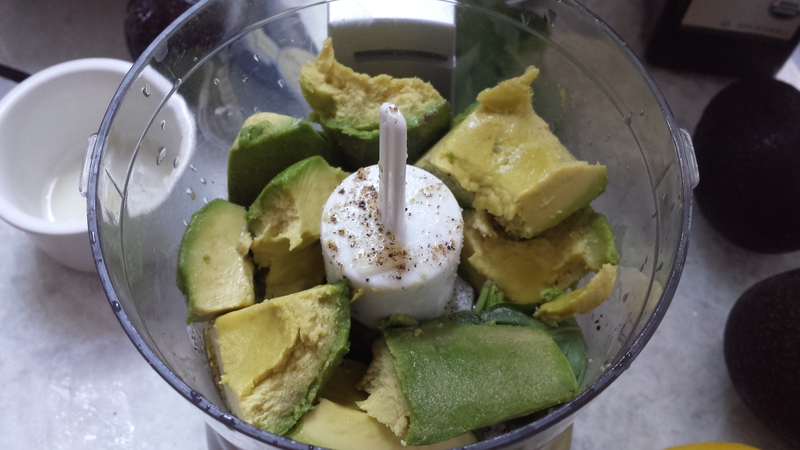 I also wanted to incorporate avocado because I had found this cool recipe that used avocado to make a creamy sauce. I had two concerns – 1) what could I substitute for pasta salad that is grain free? and 2) would green sauce totally turn people off? (kind of like green eggs and ham…). 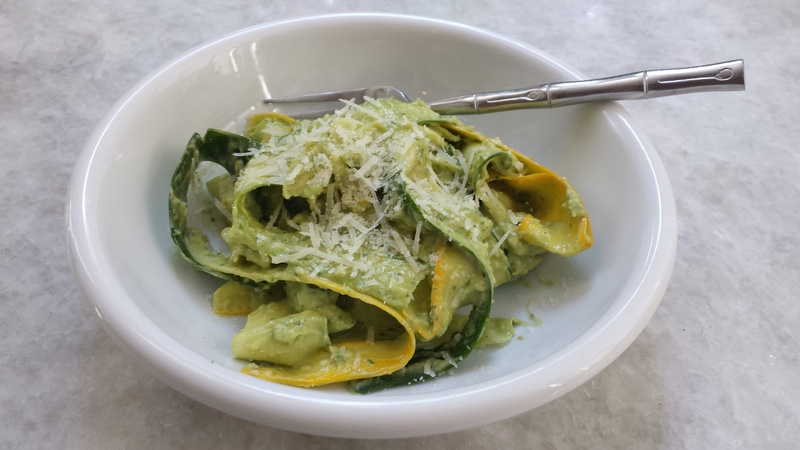 I decided that summer squash and zucchini would make nice pappardelle “noodles” without any cooking. And, if I turned the avocado sauce into a pesto sauce, then green sauce becomes something familiar. The cucumbers add a nice crunch to the salad for texture contrast. 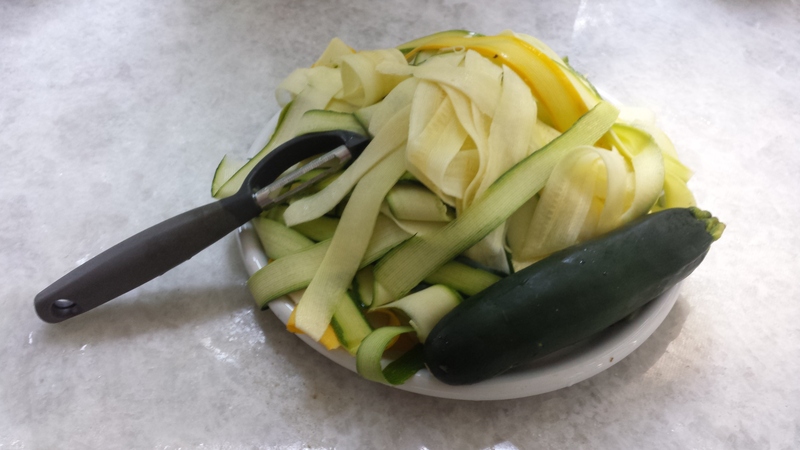 First, cut of the ends of the squash and zucchini and make pappardelle “noodles” using a hand held peeler. Next, prepare the pesto sauce. For this I used a medium sized food processor. You could also use a good blender. Add the avocado, lemon juice, fresh basil, olive oil, 4.5 oz. of pecorino cheese, minced garlic, and salt and pepper to the food processor bowl or blender. The lemon juice helps prevent the avocado from oxidizing to a muddled brown color. Mix until the ingredients are well blended and the consistency is nice and creamy. 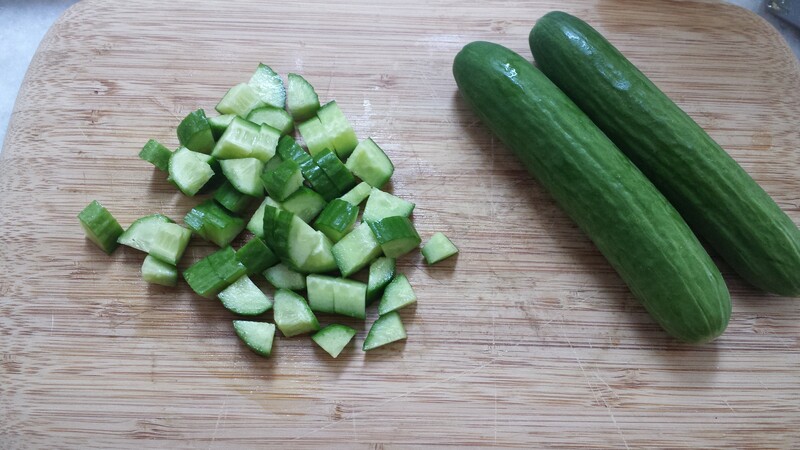 Now, dice the persian cucumbers into small quartered pieces. 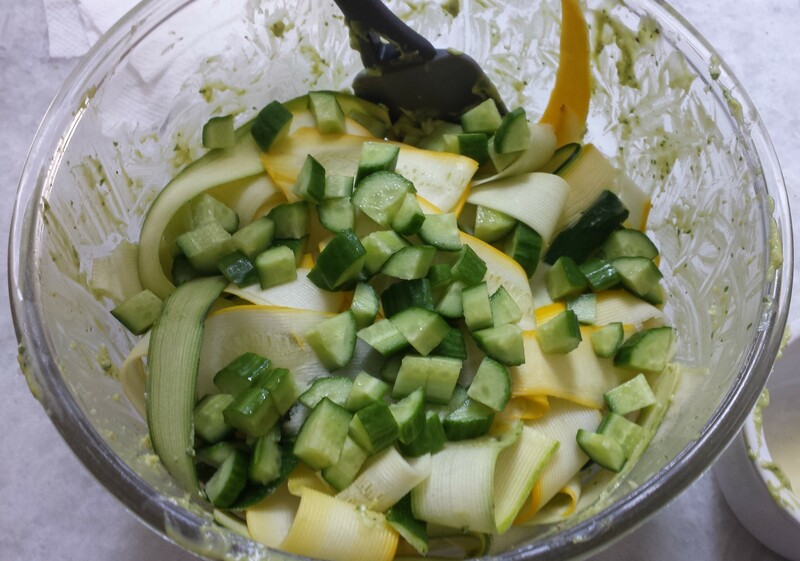 Add the zucchini, squash and cucumbers to a large mixing bowl. Add the pesto sauce to mixing bowl and gently toss with your hands. Make sure all “noodles” are lightly coated. Sprinkle with the leftover pecorino. This entry was posted in has dairy, salad, vegetables and tagged avocado, basil, cucumber, garlic, lemon, pecorino, summer squash, zucchini. Bookmark the permalink.